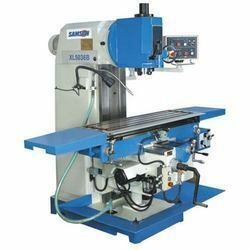 Our range of products include vertical milling machine. Backed by great industry experience, we are involved in offering Vertical Milling Machine. The provided machine is manufactured by our adept technical experts using top grade components and modern techniques. This machine is best suited for cutting and giving precise shape to metallic objects. Moreover, we offer this milling machine at pocket friendly rates to our valued clients. Looking for “Vertical Milling Machine”?